Rep. Justin Amash (R., Mich.) and a group of self-described "wing nuts" defended on Wednesday a hotly controversial amendment that would slash funding for the National Security Agency's (NSA) counterterrorism efforts. The House is set to vote on Wednesday on an Amash-authored amendment to the Defense Appropriations Bill that would defund the NSA and bar it from collecting the anonymous telephone and email records of Americans who are not under investigation for any crime. While Republicans and Democrats have joined the White House in opposing the amendment, lawmakers on the fringes of each party have championed the measure, which critics say would jeopardize America’s national security and counterterror efforts. Battle lines have already been drawn ahead of Wednesday’s vote, which congressional sources said would be very close. Asked to explain his position at a Monday afternoon press gathering, Amash argued that the NSA is violating the Fourth Amendment, which guards against unreasonable searches and seizures. "The secret [Foreign Intelligence Surveillance Act] courts have expanded the meaning of the Patriot Act to allow them to go after everyone’s records," Amash said. "All my amendment would do is return the Patriot Act to its original Intent." However, NSA officials and others say that the agency goes through regular legal channels to obtain the content of calls of American citizens. Fourth Amendment protections do not apply to foreign nationals, most legal authorities say. He left after taking a single question from the press. Republican Reps. Steve Pearce (N.M.), Raul Labrador (Idaho), Tim Huelskamp (Kan.), Steve Scalise (La. ), and David Schweikert (Ariz.) announced they would join Amash in supporting the amendment. "I call it jokingly the wing nut coalition," Labrador said in discussing those who support the amendment. "Justin is the chief wing nut." Each of the lawmakers said that they were mainly backing the measure because their constituents are outraged and scared of the NSA’s monitoring program, which has been the subject of much speculation and rumors since it was publicly disclosed by whistleblower Edward Snowden. "It’s something I hear a lot in the district," Pearce said. "They are alarmed." "Now they’re seeing a government go after everybody and that’s raising alarm on both sides of the isle," Pearce said. Rep. Michele Bachmann (R., Minn.) was the sole Republican present at the gathering to vocally object to Amash’s amendment, which she dubbed as dangerous. "We need to win the war on terror and defeat the goals and aims of Islamic jihad and for that reason I will be voting no on Representative Amash’s amendment," Bachmann said before sparing with Amash about the measure’s merits. Amash and his supporters argue that the NSA cannot legally tap into a company such as Verizon’s phone records because it violates an individual’s privacy rights. However, Bachmann noted that legally "there is no expectation of privacy" when the government requests to see a business’s internal records, which is what the NSA does. "Individuals do not own the records, the records to not belong to the individual," but the phone company itself, Bachmann explained. "There’s no Fourth Amendment expectation of privacy on right to the business records exception." Amash’s amendment, Bachmann said, would stop the United States from identifying terrorists and their larger networks in real time. This could put all Americans at risk. Should the amendment be approved, Congress will have denied "the U.S. the capability in real time, in the quick time that we need to have, to be able to find linkages to help us in pursue" terrorists such as those who bombed the Boston Marathon," Bachmann said. "They will put people’s lives very much at risk," she said. 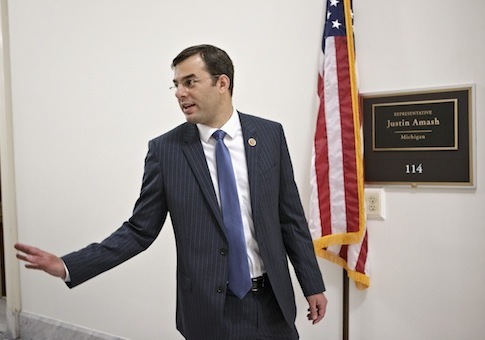 One Republican congressional aide told the Washington Free Beacon that Amash’s efforts are an embarrassment to the GOP. "It’s very likely that if this Amash amendment fails it will fail because the Democrats are more aligned then we are with robust counterterrorism policies," the aide said. "What is this saying about the GOP being the voice for a strong and robust America?" the aide asked. By attempting to demolish a program that has been proven to protect American lives, Amash "is giving Snowden a success," the aide said. "What kind of incentive does that send to everyone else about what they can achieve" by leaking top secret information, he asked. "And it’s the Republicans doing this?" the source asked "The party of Lincoln? The party that stands for a strong defense?" In addition to sending the wrong public message, Amash’s amendment would prevent the NSA from identifying a terrorist by their phone number, a routine intelligence matter that is a key tool in the fight against terrorists. "That’s specifically the tool Amash wants to take away," said the aide. Amash has further misled his supporters by claiming that the NSA is storing and collecting actual phone conversations, which it is not. In fact, the NSA stores no personally identifiable information, meaning that American identities are protected. The NSA additionally does not collect individual phone records or billing statements, only phone lists directly from a company. These tactics have helped the security agency map terrorist networks and stop them. "Amash likes to say this is not a valuable tool and has not affected terrorism investigations and that is flat wrong," the aide said. This entry was posted in National Security and tagged Congress, Edward Snowden, Federal Bureaucracy, Justin Amash, NSA. Bookmark the permalink.